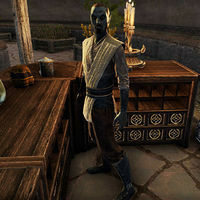 Div Nervion is a Dunmer merchant who runs St. Olms Market in Saint Olms Plaza in Vivec City. "Welcome to my humble shop. If you'd be so kind as to make a purchase, I'd be eternally grateful!" "Trade has been slow ever since the mountain started rumbling. Please, if you have even a shred of compassion, buy something from me today!" "I don't mean to be forward, but you're the eighty-seventh customer to walk through that door—and the last eighty-six didn't buy a thing. Please, good customer, change that pattern and we'll both be wealthier for it!" "People come by to look. They always want to look. But do any of them open their gold pouches and offer to make a purchase? Fewer than I'd prefer, I'll tell you that!" This page was last modified on 7 March 2019, at 12:30.